A lot of people are afraid to work with yeast, don't be, there are just a few simple things to remember. First, the water that the yeast gets mixed into should always be just warm to the touch (105-115) but you can use a thermometer if you want too. Second, most recipes call for letting the yeast mixed into the water and something else sit for about 5 minutes until it's foamy. That is always a good idea, if your yeast doesn't foam it's old and you don't want to use it anyway and you haven't wasted any additional ingredients. If you remember those two things you should be fine. These doughnuts were originally fried so if you feel so inclined then you could fry them on the stove or in a fryer. I baked them though because it's healthier. Now, the fact that I cut the recipe and half and thought I would get about 12 minis and we had company coming over worked out great in my head until it made about 20 minis and our friends couldn't make it over and I forgot to take them when I saw them later so then we had to eat them all, not thought through very well. But, at least they weren't fried so they were little puffs of baked goodness filled with strawberry jelly. Yes, I know some of them are dipped in butter and sugar too. 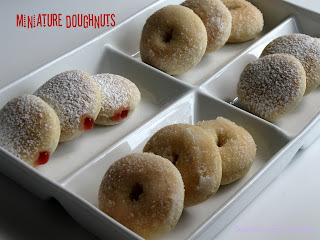 This would be a great baking project for kids because once they are baked you could dip them in melted chocolate or a confectioners sugar/water glaze then sprinkle them with well...sprinkles, finely chopped nuts, or something else fun like pastel colored sugar for Easter. So, I hope to see some comments from people who have tried this recipe or another one and how enjoyed them. 2. Whisk together flour, remaining 2 tablespoons sugar, salt, baking powder, and cinnamon in large bowl. Grease separate large bowl with oil. 3. Stir yeast mixture into flour mixture with wooden spoon until sticky dough forms. Stir in 1 ½ tablespoons melted butter. Turn dough out onto well-floured work surface, and knead 6 to 8 minutes, or until smooth, soft, elastic dough forms (I mixed it in my mixer on medium about 4 minutes). Add flour while kneading, if necessary. Transfer to oiled bowl, cover with towel, and let rise in warm place 1 hour or until doubled in size. 4. Preheat oven to 350F. Dust baking sheet with flour. Roll dough out to 1/4-inch-thick round on well-floured work surface. 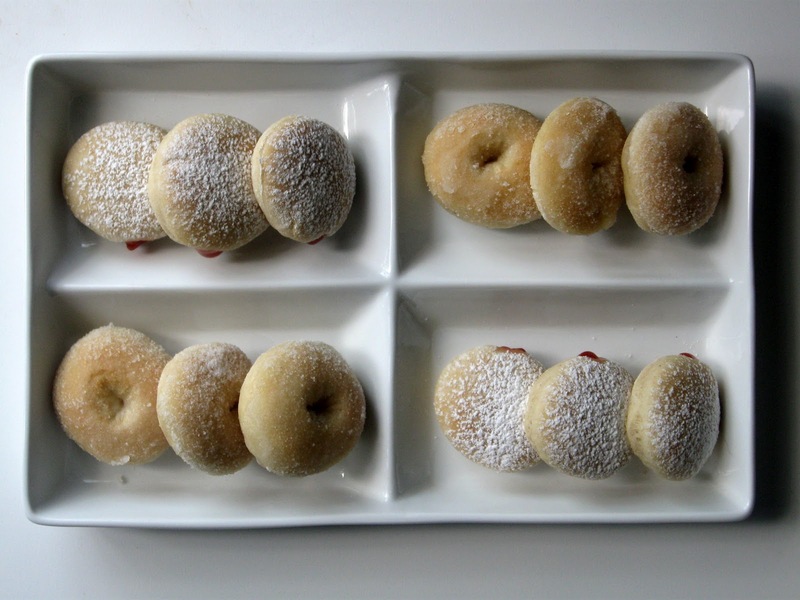 Cut 20 circles from dough with 2-inch round cutter. If desired, cut a ½” hole in the middle of half of the doughnuts. Transfer rounds to prepared baking sheet, and cover loosely with plastic wrap. Let rest 15 minutes. 5. Bake at 350F for 10-11 minutes or until lightly browned and fluffy. Cool slightly on rack. 6. Poke small hole in side of each full doughnut with toothpick or wooden dowel. 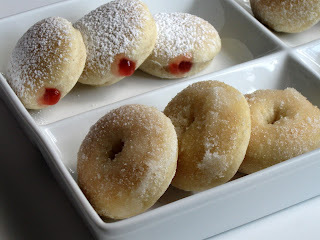 Use pastry bag fitted with small round tip to fill each doughnut with ½-1 teaspoon strawberry berry jam (I used a small whisk and whisked the jelly in a small bowl so it would be smoother for piping). 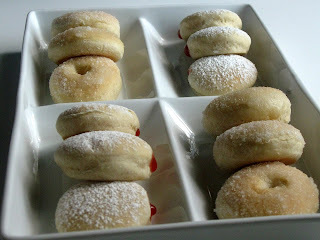 For the doughnuts with a hole, dip one side into the 2-3 tablespoons melted butter then into the superfine sugar.